Made in NYC will kick off the 2017 holiday shopping season with a special pop-up on two consecutive Sundays at the Upper West Side’s Grand Holiday Bazaar. The Gifted & Talented Holiday Market is the first and only market in the city dedicated to gifts made exclusively in New York City. 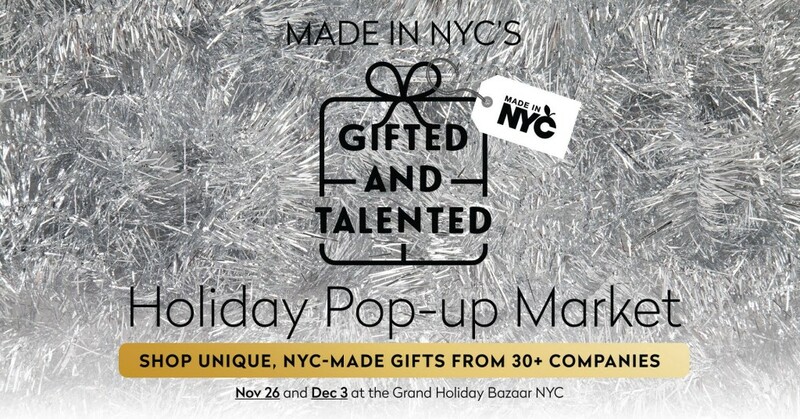 A market within a market, Gifted & Talented starts a limited engagement at the Grand Bazaar NYC for two consecutive weekends. Over 30 vendors have been selected to come together for this remarkable seasonal event representing the most gifted and talented that NYC has to offer. Holiday shoppers will discover locally-made, handcrafted selections including leather goods, jewelry, scented candles, chocolates, jams and hot sauces, and more. They will have the opportunity to support local artisans, designers, pâtissiers, chocolatiers, and distillers to find the perfect one-of-kind gift item for the special people in their lives. Most importantly, Grand Bazaar NYC exemplifies true holiday spirit by donating 100% of its profits to four local public schools, benefiting over 4,000 children, so shoppers can feel extra special knowing that their purchases will enrich the lives of fellow New Yorkers. A selection of items from Gifted & Talented vendors as well as other MINYC manufacturers will be available to discover and purchase online on the MINYC website (madeinnyc.org) from November 18 through the end of December 2017. No user commented in " Gifted & Talented Holiday Pop-Up by Made in NYC "